If you’re looking for a high-end tanning oil, then grab a bottle of the Just Nutritive Body Nutritive Serum. This all-in-one tanning serum and skin care moisturizer will not only give you a great looking tan, but it will also improve elasticity, tone and nourish your skin like never before. It has a bunch of great nourishing and restorative ingredients to promote healthy skin such as hazelnut seed, grapefruit peel, lavender, apricot kernel and peach kernel oils, along with walnut, avocado, kukui nut extracts and vitamin E.
I find the Just Nutritive Body Nutritive Serum to be a decent tanning oil/moisturizer. This is merely a tanning oil for enhancing the look of your skin during and after sunbathing; it keeps your skin hydrated and supple as the sun penetrates it. There are no tanning agents, i.e. dyes or bronzers to darken your complexion. The serum goes on clear and serves as a super moisturizer so that your skin doesn’t dry out during tanning. It can also be used without excessive sun exposure and simply as a daily moisturizer however, I’m not a fan of the smell of this tanning serum. It has the scent of some type of plant-based chemical mixed with some fragrant and is not something you’d normally associate with a skin care product or want to have on your skin throughout your day to day routine. Application is important to achieving the best results with using tanning products and especially this tanning serum. You may want to rid your skin of all other types of skin products, so perhaps its best to take a shower before applying. Then spray the serum on several parts of a particular body part – for example, I spray a couple tads along the length of my hands/ arms and then rub the solution into my skin in a massaging motion. I continue using this method to apply the serum all over my body with the intent of smoothing and evening it out everywhere that will be exposed to the sun. I use a sunscreen mist with this serum, because it doesn’t have SPF protection. I apply the serum first then the mist after, just lightly spraying it over my body without rubbing it in. The mist goes on light without affecting the way the serum coats my skin. I usually lay out in the sun for about 30 – 40 minutes with both products on my skin, this allows me to get a great golden, sun kissed tan all without getting burnt or blotchy looking skin. The texture of the Body Nutritive serum is similar to that of a rich kind of oil; it is quite silky and goes on very smooth. It leaves my skin looking shiny and feeling deeply moisturized in just one use. I would say it is also very water resistant as I find that when I begin sweating from sitting out in the sun, it simply forms water droplets on my skin, preventing the sweat from penetrating. They’re several Just Nutritive products, from tanning oils and lotions to shampoo and conditioner. The packaging and bottles are almost the same looking and differ in size, lid covers and dispensers. This particular one — the Just Nutritive Body Nutritive Serum, like the other variants of its brand, is contained in a translucent dark brown bottle with a spray-top dispenser. The label in front is beige with the Just Nutritive name written in green and in an artsy script. The product type, i.e. Body Nutritive Serum is written in red below followed by a short summary of the serum’s description. Overall it’s a very simple design and it quite easy to locate in the event you decide to give it a try. They are sold online at the Just Natural (JN) Skin Care store as well as amazon and also at your local Target or Walmart locations. The serum is rich and effective in deeply moisturizing my skin and helps to prevent sunburn and the drying effects from the sun. There are a bunch of other comparable products on the market that has similar effects and better scents, you may even find them with tanning agents. But for what this product is, and that is a tanning serum, it is quite good with the added perks of skin nourishing properties to improve your skin in every use. Rest assure, this Just Nutritive Body Nutritive Serum is of the highest standards in its make-up. Along with all the great nourishing properties, there are no harmful chemicals or ingredients to be wary of. 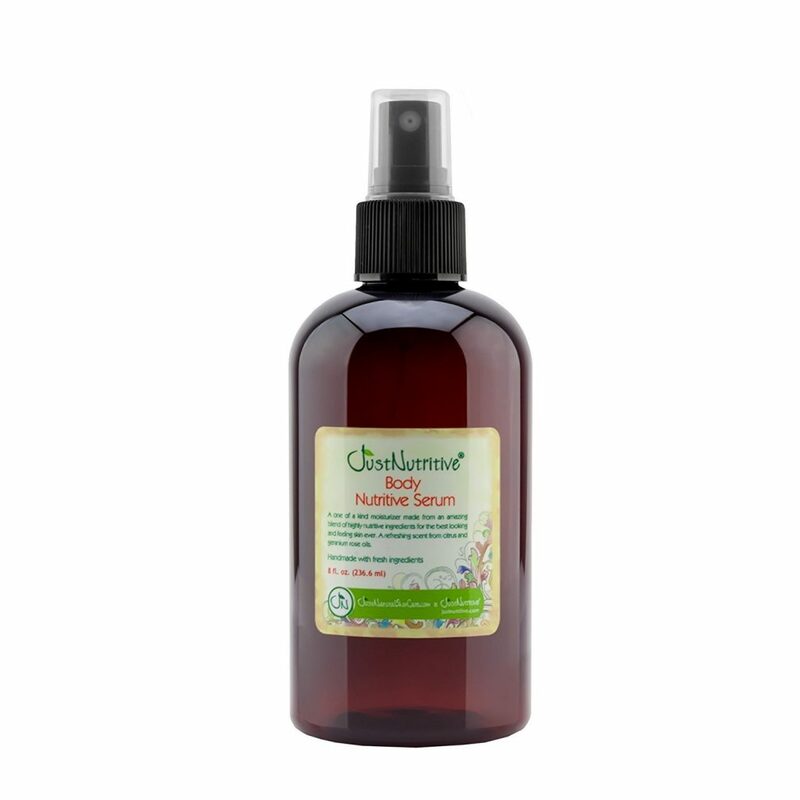 It is alcohol free, contains no parabens or mineral oils and as such is pretty safe to use. I wish it had SPF protection and a better scent and for that reason I give it 7 stars out of 10.